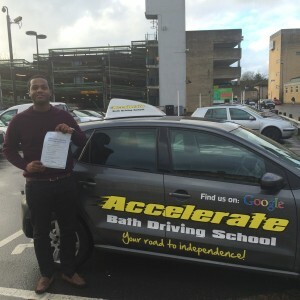 “I chose to use Accelerate Bath Driving School because of all your good reviews, I was also recommended to you by a friend of mine. 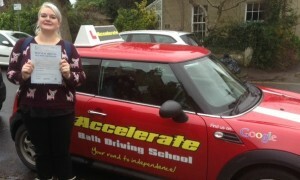 Congratulations to Esme Holloway of Bath who passed her practical driving test on the 11/12/15 with just 1 driving fault. This was Esme’s first attempt with Accelerate, enjoy your new found freedom. 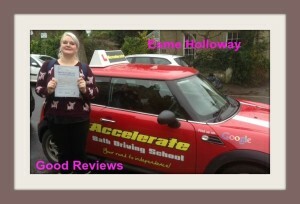 All the best from Tony Field your driving instructor at Accelerate Bath Driving School. 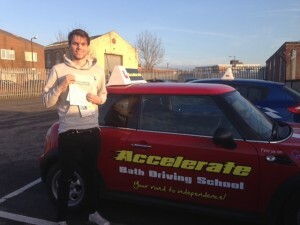 Well done to Sam Brake of Bath who passed his practical driving test at Brislington test centre in Bristol first time with a perfect drive, not many people can say they did that. Excellent result for you and Tony Field your driving instructor, who wishes you all the best in the future. 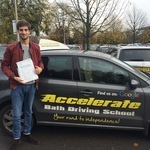 Congratulations to Arthur de Gibon of Bath who passed his practical driving test at Chippenham test centre on the 4/11/15, with a very nice drive.